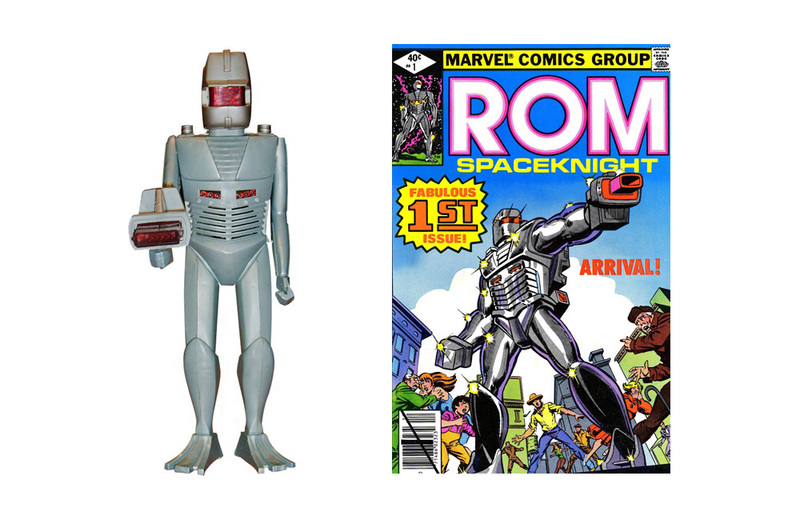 ROM The Space Knight made its debut in 1979 and was one of Parker Brothers’ first forays into products that were not board-game based. In its advertising, Parker Brothers referred to the toy as “a micro-electronic creation”. It was originally named COBOL (after the programming language) by Lawrence McCoy, its inventor, but was later changed to ROM by Parker Brothers executives. As you might have guessed, ROM was short for Read Only Memory. The action figure was approximately 13-inches tall with articulating shoulders, hips and knees, which made him less pose-able than other action figures at the time (notably dolls from Mego Corporation). But, what ROM lacked in flexibility was made up for with built-in electronics. He has two red LEDs for eyes, two additional red LEDs in his chest, and two more in his attached jet pack. All of these lit up and/or pulsed when he was powered on with the help of a 9-volt battery. ROM’s light show was complemented by audio effects. Pressing the two buttons on his back in different combinations produces a variety of sounds, including breathing and sounds for his various accessories. Click Play to hear various audio samples from ROM The Space Knight! To build interest in the toy, Parker Brothers licensed the rights to use the character to Marvel Comics. Marvel, in turn, created a comic book that featured ROM and provided a detailed back-story for the toy, including his origin and a rogue gallery of foes to do battle with him. Despite the cross-promotion, ROM met with limited success, selling less than 300,000 units. The comic book lasted far longer, running for over 6 years and a total of 75 issues (the last was published in February 1986). Through his six-year run in comicdom, ROM developed a bit of a cult following, with fans recently calling for him to re-appear as part of the Marvel universe. To celebrate the toy’s 35th anniversary, Hasbro (the current rights holder) added ROM to its Mighty Muggs line of toys and released him exclusively at the 2014 San Diego Comic-Con. Tony Temple – arcade game historian, collector, and writer – explains why so many classic video games are set in space. For over 50 years, the friendly-faced Chatter Telephone from Fisher-Price remains a classic pretend play pull toy for generations of young children.